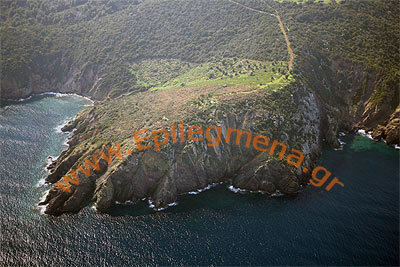 PROPERTY DESCRIPTION: SITHONIA. In an amazing part of the hinterland, in a forest, with a river on one side , on a 13.000.000m2 land of a breathtaking, unique beauty: A development plan with complete technical study of a mixed use: Touristy (with 3 hotels 900 Rooms/1.800 beds in total), Residential (2.200 houses from 70m2 to 130m2 each, shared in to 32 settlements/villages), 4 Golf Sites, Health and Rehabilitation Centre of 350 rooms, Congress Centre, Farming/Horseback riding Installations, as well as an energy park 150MW. PROPERTY DESCRIPTION: KASSANDRA. 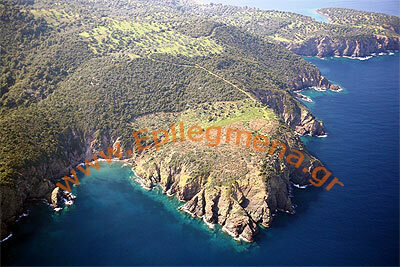 Small cape on the Eastern side of the island, with 600m2 coastline and height of 60m from the surface of the sea. 2 kilometres distance from the touristy village Agios Nikolaos (with beautiful beaches, Marina, taverns, market). With surface of 8.800m2 may construct 288m2 residence or 600m2 vocational building (except hotel). Small beach on the south, area for a secure boat dock. Unique place, with panoramic, unlimited, breathtaking views. Halkidiki is the three fingered peninsula in yellow on the map to your right. Halki-diki is in northern Greece, in Eastern Macedonia to be exact, and has many lovely sand beaches. In antiquity, settlements/cities were founded here by colonists from the Greek city-state Halkis in Euboea, central Greece. Halkis was a contemporary of other city states like Athens, Thebes, and Sparta. With time Halkidiki took off, particularly Olynthos (below) which was later trounced by Alexander the Great's father, Phillip II who, according to Demosthenes, "razed it to the ground". Some small confusion arises from the similarity of names Halkida and Halkidiki, since one is derived from the other. Halkis is a city (which still exists), that in antiquity, colonized and named the peninsula Halkidiki. Now you know! Roughly, it's pronounced Hall-kee-dhee-kee, with the accent on the last syllable. 'Halkos' is the Greek word for 'copper', though also used for bronze part of the time. The original inhabitants of Halkis were reknown for their metal-smiting skills. Halkidiki jumps out at you when you look at a map, with its three dangling udders that project into the North Aegean, the Thermaic Gulf (gulf of Thessaloniki) on the west and the Orfani gulf on the east, and in between, the gulfs that separate them. The Chalkidiki peninsula as a whole lies southeast of Thessaloniki, with the shallow lakes of Koronai and Volvi on its northern boundary. These lakes are wet lands and many local and migratory birds nest here. The Chalkidiki peninsula is divided into two separate administrative districts basically Mt. Athos and everything else - one of them making up most of the larger peninsular territory south of the lakes, and the other comprising the territory owned by Aghion Oros (Mt. Athos), the monastic 'republic', occupying all of the territory on the easternmost finger. Each of the three peninsulas has a name, which are, from west to east: Kassandra, Sithonia and Aghion Oros. We will start below with the northern section of Halkidiki and deal with the peninsulas individually further along. This route takes you southeast from Thessaloniki to the head of the eastern most peninsula and the town of Ouranoupolis "heavenly city". Its the gateway to the divine precinct and Greek Orthodox Church H.Q. We try to follow the main roads and don't have much choice in the matter as the central mountains hem one in. This is a varied area with something for everyone and highly recommended. Loutra Thermis is a little spa with hot springs; Vasilika has some tavernas; Souroti, off on a side road, also has mineral waters. 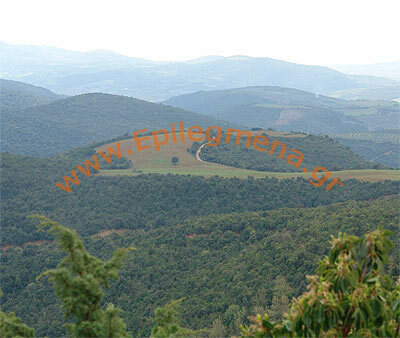 Entering a wide valley past here, you cross the prefecture boundary of Chalkidiki (distinct from that of the Mt. Athos enclave on the easternmost sub-peninsula). If you turn left at the crossroads further on, in 3km/1.86miles, you come to the monastery Moni Ayhia Anastasia Pharmakolitria (founded in 888AD) (left). Galatista a mining center with about 2500 inhabitants, is on the site of ancient Anthemous. There was a Communist massacre here in 1945. Mt. Kholomon (1165 meters/3821feet) has chestnut trees on its slopes. The road climbs to a ridge below the peak and descends into Arnea, a town of 2500 population, in a lovely wine and fruit growing region. Megali Panayia Monastery is also in a beautiful setting. In the mountains southeast of Thessaloniki about 50km/31miles is the cave of Kokkines Petres (cave of red stones) to the south of the village of Petralona. A hominid skull was found here, 700,000 to 260,000 years old, and animal fossils from prehistoric times displayed in a museum at the entrance to the cave. The stalactites and stalagmites are worth seeing if you like caves. (Open daily 9am to sundown; 5 euros for the guided tour, which is all that is allowed. No photos permitted. There is a Byzantine fortress at Stayira, Byzantine church, and a statue (right) of Aristotle, whose birthplace was in nearby ancient Stayira. Though fenced off, it's open now and then and you can wander around, but there isn't much to see. Gold and silver were mined in ancient times in 16th century Stratoniki, in the hills near Stratoni where magnetite and iron are worked in present times. Generally speaking, Stratoni is a rather dull place, what with the mining presence. The beach of Proti Ammoudia is near here. Along the coast in this area, new forests have been planted. The road north from Stratoniki is scenic. Olymbiadha, is a fairly unpretentious coastal resort. A strong local effort (publicized in national media) prevented the establishment of a very toxic gold-processing plant here during the late 1990s, and the toxic works ended up in Stratoni. There are two campsites by a stream close to Olymbiadha and some nice tavernas. Mussels in a piquant cheese sauce is a local culinary specialty. 12km/7.44 miles to the north is Stavros (left), more developed, more kitschy and bigger than Olymbiadha, but with a nice waterfront with plane trees and some decent tavernas. In between the two towns are some coves you might swim in. The westernmost, most fertile, and most developed of the sub-peninsulas is Kassandra, which used to be more of a holiday destination for Greeks, though since the 1980s, the European package-tour companies have had their full impact. The southern coast, however, still gets a lot of weekend Greek visitors, mostly from Thessaloniki. Despite the ubiquitous presence of tourism on the coasts though, there is considerable forest along the central ridge and some nice villages, built after the War of Independence which began in 1821, during which much of the local population was massacred for its participation. This peninsula is the most fertile of the three and was cattle and sheep-farming country in its inland parts before that war. The locals actually tried to back out of their announced decision to join the resistance, feeling unprepared, but the Pasha of Thessaloniki killed them all and destroyed their settlements. The coastal areas, previously scattered fishing villages, received an influx of Asia Minor refugees from the Sea of Marmara area in 1923, and, like so many quiet fishing villages all over Greece, developed into holiday decades later. Nea Moudhania, a town of about 5000 population, is the first of these, on the coast at the northern end of Kassandra, just at the point where it begins. It sits at the juncture of the roads heading south along the eastern Kassandra coast and east over to Sithonia, sub-peninsula. Just down the road 6km towards Kassandra, is Nea Potidhea, across an ancient canal (left). This was one of the refugee villages, which has become very kitschy. From there the road hugs the eastern shore of Kassandra, along the Kassandra Gulf. Nea Fokea sports the medieval St. Paul's Byzantine watch tower, a pleasant harbor and beach (above right). Afytos, 5km/3.1 miles to the south, is a vast improvement over the preceding sights, though still very much of a tourist destination. Traditional tile-roofed houses drape several ravines along the sea bluff, which eventually plunges straight down to a beach that has some springs in the rocks at its edge. The villages Afytos and Siviri put on the Kassandra Festival with many kinds of music as well as Shakespearean and Greek plays. At Kallithea the road heads both south and west, forming a 76km/47mile circle that encompasses the entire lower two-thirds of the peninsula, enabling you make a circular journey. The east coast road is pleasant, keeping close to the sea and passing through wooded hamlets. At Paliouri there is a large N.T.O.G. campsite. Kallithea itself is not an appealing place with the worst features of package tourism, including big hotels. The same holds true for Kryopiyi (left) (which means 'cold spring') although the latter has kept its old village. Further south: more resorts of the worst type. There's a campsite at Pefkohori though, which sits on a lagoon with pine trees, and others at the bay of Khroussou. Ayia Paraskevi is a rather pleasant surprise-a relatively non-touristic village with views of the sea. A 1998 fire finished off a lot of the pine trees between here and Loutra on the west side of the southern tip of the peninsula. The latter, a sea-side hot springs and spa is nothing to write home about. A nicer place is Nea Skioni, a fishing village with tavernas with freshly-caught fish and a good beach (again, an anomaly in touristic Kassandra), and also very appealing is Kalandhra. There is a cape here with a lighthouse, and Posidhi beach. You can swim at the cape, but the campsite in the pines is only for University of Thessaloniki students. To the north, Siviri is another nice fishing village, though, with a very nice beach (right), good tavernas, and nightlife. Sani can be reached by driving east, then north, and west again, as there is no road north from Siviri. Sani (left) has a summer festival, with contemporary Greek music, jazz, salsa, and world music. Though there are a good number of trees on Kassandra peninsula, Sithonia has trees too-forests of sea and umbrella pines-- and is generally greener, hillier, and has sharp hills and rocks, secluded inlets and sandy beaches, fiords along the rocky rugged coastline--all of which makes it more attractive, in addition to its having far less touristic development. There are also fewer villages, though the ones it has are from the 1920s, with asia minor refugee settlements. Across the water from the eastern coasts, wonderful views of Mt. Athos peninsula across the way are also to be had. Metamorfosi a modern village with two campsites and a view of Mt. Athos's peak. Ormos Panayia not such an interesting place and much of a resort.with villas. Vourvourou a holiday resort for professors from Thessaloniki on land confiscated from a Mt. Athos monastery. Established during the 1950s. Campsites and islets in the mouth of the bay, but narrow beach and yachts. Good beaches are, on the eastern shore, to the south between Vourvourou and Sarti, with many nice bays and sandy coves, with campsites in the latter and and not much development. Signs point the way. Sarti, though it boasts a 2km beach, is a concrete town and receives a lot of visitors from Germany, the Czech Republic, and Hungary. Campsites too, though this place is pretty built up for tourism. Paralia Sykias is less built up than Sarti, though its beach isn't as nice. Campsite. Inland from here is Sykia, which is large and hidden by cliffs. Kalamitsi has a double bay with islets in it and development is minimal. A beautiful place with campsites on both bays (with the North Aegean scuba center on the northern one. Porto Koufo is enclosed by cliffs. Submarines hid here during World War II. There's a good enough beach, and a fishing and yacht harbor a short distance away. Torone (left) has a beach two kilometers long and, though this southern tip of the peninsula generally has no trees, there are wooded hills behind this one. An archaeological site (not visit able) sits on the cape, with a fortifications (probably from the Classical period) and several Christian basilicas on it, one of them (Ayios Athanassios) with frescoes and mosaics that were well-preserved. Excavated by a Greek and Australian team, the site was inhabited from prehistoric times until the 18th century AD. Many Germans and Czechs visit Toroni. Another beach of two kilometers is at Tristenika (also called Aretes, which is less developed than Toroni, perhaps because it is off on a dirt road (a sandy one) of about 1800meters/5900 feet. Between May and September, the campsite is open, and another campsite with its own beach and three islets is found between Cape Papadhia and Lykithos, a tiny village. There are olive groves here and some cabins. Porto Carras (right) built by a very wealthy Greek businessman from the wine and shipping dynasties (now deceased) on 18sq km as a resort for 3000 guests and 1800 residents, with a theater that seats 4500, a yacht marina, sports and cultural facilities, shopping centers, and a farm producing olives, citrus, almonds, and wine-grapes for the complex. Sold off after the owner's death to three big hotels. Neos Marmaras is a former fishing harbor with a smallish beach visited by both Greek and German visitors now that there are rooms and apartments. To the north 3km/1.86 miles is another beach (sandy) and campsite. Parthenonas (left) at the foot of Mt Itamos (808meters/2650feet) is the closest thing to a 'traditional' village that you'll find in Sithonia, mainly because it was deserted (during the 1960s) when people moved closer to the sea. The old houses are being bought up and restored by well-heeled Greeks and Germans. There is a nice stone pension here with accommodation. The road to Parthenonas is quite decent, with olive groves and pine trees. The eastern peninsula of Athos was known in ancient times as 'Akte' , According to Herodotos and Strabo, Pelasgians came there from the island of Limnos and founded five cities, and there were also colonies from Eretria (in Evia). The peninsula is 50km/31miles long and its width varies between 5 and 10km/3.1 and 6.2 miles. A narrow isthmus connects it with the upper part of the Chalkidiki peninsula. It is covered with forests of oaks, chestnuts and pines Mt Athos (the mountain) is on its southern tip and is 2033 meters/6670 feet high. Steep slopes drop straight down into the sea below. Aghion Oros ('Holy Mountain'), which occupies all but the very northernmost part of the Athos sub-peninsula is its own 'nomos' or prefecture, and encompasses 339 sq km making it a monk's mini-republic--administratively autonomous within Greece since 1926, with all monks (no matter from where they come) required to become Greek citizens. Women have been banned (and all females of any species larger than birds) from Aghion Oros since a Byzantine imperial decree of 1060 and all visitors consequently and exclusively male. You can get over to Athos from Sithonia via Nikita on the west coast (first crossing over to Ayios Nikolaos on the east ( which is just north of Ormos Panayias) and from there its not far to Pyrgadhika a fishing village built on a ravine near the Sigitikos Gulf (Ayion Oros Gulf). The better beaches are along the way there, and starting around Paralia Salonikiou. Inland, at the northernmost part of the Athos peninsula, the most interesting town is Arnea, with some historic neighborhoods and Balkan architecture, with the historical and folk museum housed in one of these, with woven goods, carpets, and excellent honey. Some of the old houses have also been made into guest accommodations, and are very attractive, one of them an inn with restaurant in a wonderful 19th century abode, with big hearths. Paleohori a little further on is nice, though the houses are more recent. This general area has some trees up high and picturesque scenery as you make your way down to the beach resort of Ierissos, along a gulf with a promontory. Unfortunately the sizeable town here (back from the sea), had to be rebuilt after a disastrous earthquake in 1932, and the modern construction material of choice in such cases is concrete. Beyond here is Nea Rodha, with little to recommend it. Ammouliani is a small island (left) off of the coast across from Trypiti , which is at one end of the old canal built by the Persian emperor Xerxes during the 5th century AD. The coast of Athos actually faces southwest at this point. There are ferries from Trypiti to the island which was settled by Asia Minor refugees from the Sea of Marmara (like Kassandra), with its main industry fishing--up until recently. The summer peak season now brings rather too many tourists, but it's a nice place to visit off-season. The port is its only town, in which there are no old buildings. The best beaches are to the southeast on a dirt and sand road a little way past town near the Agionissi resort. Megali Ammos (Big Sand) is very beautiful, but a bit touristic, though there's a campsite there amid olive trees. Just beyond the port (back-tracking now) is the one below the chapel of Ayios Yiorgos, where you'll find some rooms and tavernas near the fine beach. As always, the most secluded beaches are harder to get to-in this case-in the island's northwest with boats leaving from town in high season, though you can get to them on foot and by bicycle as well. Ouranoupoli The last town before Ayion Oros, and a big resort as well as entry and departure point for Ayion Oros, but neither the town or nearby beaches are appealing, There is a Byzantine tower here, Phosphori (Tues-Sun 9:30am to 4pm;free), where the author of a guide to the monasteries of Ayion Oron lived for thirty years, the book published in 1957, after his death. Sydney Loch and his wife were a missionary couple (Scottish and Australian) who taught refugee villagers carpet weaving, and dedicated themselves to otherwise helping them. Getting in these days a prior phone is required to make a reservation to the Pilgrim's Office in Thessaloniki 2310 861 611 and 2310 861 811. Since only ten permits per day are offered to non-Orthodox (one hundred to baptized Greek Orthodox of any nationality), and you may have to take pot luck with the entry date granted, especially between May and September. At Easter, you'll want to apply weeks in advance. The maximum prior reservation time is six months (though you will be sent or given a paper to later be exchanged for a permit, including via fax). The paper is exchanged for a permit at the Pilgrims' Office in Ouranoupoli (left) (8:10am-2pm, daily). The cost is 30 euros; 15 for students with student cards. The typical stay is four days, with three often granted, especially during the off-season. The permit entitles you to stay and to eat at the main monasteries without additional cost (though various items are for sale including candles, reproductions of icons, etc.) The food is grown by the monks and includes typical Greek fare: beans, olives, tomatoes, greens, cheese, bread, though one shouldn't expect chocolate. Visitors often bring some food to tide them over between the mid-morning meal and the about two hours before sunset (which means maybe 7:30 in summer! ), especially given the amount of walking between monasteries (though other kinds of transportation are available as well). Leftovers are often available if you arrive late for a meal. The Julian calendar is observed here, which is two weeks behind modern time In addition, there are a couple of ways of reckoning time of day, and those differ between coasts, though there are also other clocks and watches showing the time as reckoned in the rest of Greece. Bedtime is at sunset. Dress codes require covering of arms and legs at all times and not wearing hats inside, no smoking (with some exceptions, but with extreme caution against forest fires), speaking softly and not whistling or singing, not photographing the monks without permission (but in some monasteries totally forbidden, as are video cameras in all of them), not crossing your legs while seated..and the list goes on. Below is a dress code request for a Peloponnesian Monastery where women are at least allowed into the adminstrative areas. Aghion Oros suffered incursions from both pirates (12th century) and Franks (Catholics)--the latter especially after the Fourth Crusade, when Venetian Catholics sacked Constantinople and then occupied it from 1204-61. Relations with the Ottomans was relatively good, due to the fact that the monks had the sense not to resist (though they participated during the 1821 War of Independence, with the result of having a Turkish garrison on their turf). After that war, numbers of monks dropped radically, despite some efforts of Russian monks (and monks of other nationalities) to fill the gap, but there was resistance to this on the grounds of keeping Athos mainly Greek. Numbers dropped to an all-time low during the 1960s, but has lately picked up. Today there are around two thousand monks at Ayion Oros, many of them younger than in earlier times and also better-educated. The mix of ancient and modern elements is certainly something to put visitors in an altered state of consciousness, what with the various clocks , fax machines and telephones in an environment essentially Byzantine and medieval. The famous cliff-hanging monasteries are all in the southeast part of Ayion Oros, (as is the Mt. Athos itself), including Aghiou Dhionysiou which has illuminated gospels on paper containing silk and ivory crucifixes in its stupendous library. Another is Osiou Grioriou, just above the sea with rocky cliffs around it; and Meyistis Lavras (The Grand Lavra) (left) also in the southeast, is the oldest, second largest and most important -- is physically stunning It is the only one of the twenty monasteries that never suffered a fire, and resembles a simple fortified village (but with fifteen chapels inside its walls). It stands on a low hill overlooking a small harbor with a fort guarding it. One enters through a long vaulted passage that winds past huge iron gates and into a courtyard with two ancient cypresses, which are said to have been planted when the monastery was founded. The library has two thousand manuscripts, and art-work that includes painted relief's, frescoes, painted Baroque doors from Ottoman times. Directly above the Grand Lavra, the peak of Mt. Athos looms 2033 meters/6668feet. You can climb it in a day, leaving early morning and returning before dark. The Chapel of the Transfiguration is at the top, and a service is held there every 6 August. 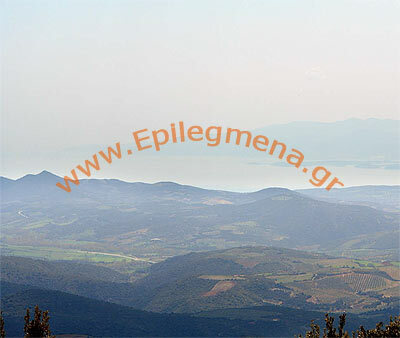 The view is panoramic and magnificent, and includes the entire north Aegean, given a clear day. The southern tip of the peninsula to the south of the Grand Lavra and inland to the west, has some wonderful untouched trails through rugged and spectacular countryside. There's a spring at Aghios Nilos which is one of the few springs on Athos that hasn't dried up, with a hermit cave near it in the cliff. If you take a caique in the morning from Kafsokkalyvia's arsenas and get out at the port for the hermitages of Karoulia and Katounakia, you can climb in three quarters of an hour to the Dhanilion academy and hear Byzantine chanting. Aghiou Pavlou is is tucked into spectacular cliffs above a raging boulder-strewn river. Rather than being named for St. Paul (which one would guess at first) it is named for a son of an emperor. who was its great benefactor (Maurice, by name), and was founded by Serbs and Bulgars. The convent of Dionysiou, a coenbite convent occupied by 40 monks, stands on top of a steep rock over a gorge by the sea, and is reached by climbing 420s steps. The coenobitic convent of Simonopetra sits 305meters/1004 feet up on a rock with nothing on three sides, but with a bridge of three superimposed arches joining it to the cliff. In the north there is the Russian monastery Pandelimonos, with onion-shaped domes, but rather hastily-built utilitarian buildings from the middle of the 19th century, erected by Tsar's with an agenda to increase the Russian presence in Athos. There's a lot of gaudy display here, though the Slavonic chanting is worth hearing. Zografou is the furthest inland of the monasteries (and quite a bit north) is inhabited by older Bulgarian monks, while Hilandhariou has been Serbian enclave since the 13th century. A wonderful trek begins at the monastery of Esfigmenou, following the coast for about three and a half hours to Vatopedhiou monastery; with stretches of kalderimi (old cobbled paths) here and there. Vatopediou (left) is the largest monastery on Athos in size, with a cobbled courtyard reminiscent of a town square, surrounded by stairways and cells for up to three hundred monks. There are some remarkable frescoes here from the 14th century (Macedonian school).